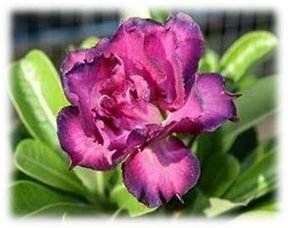 Adenium obesum 'Double Purple'. A great plant for those that collect caudiciforms (swollen trunks), or uncommon succulents. Better Gold is slow growing and thick stemmed with a smooth trunk that becomes very swollen and somewhat contorted with age. Adenium obesum 'Better Gold' is known for its golden flowers and unique trunk. Always in great demand. A unique genus from Madagascar. Not a common plant. It does best with lots of sun and allowed to go dry between waterings. It makes a fantastic bonsai! It is a succulent, and forms more of a bush than a tree. In summer you can move the plant outdoors to a sunny or partly shaded location.